The EcoPure H20 Anti-Scale Media was especially developed and manufactured to protect against the formation of scale and remove already existing scale from pipes and heat exchange surfaces. Reduces soap and chemical consumption. How does our Anti-Scale Media System work? Hard water is made up of calcium ions (Ca2+), magnesium ions (Mg2+), and bicarbonate ions (HCO3-). Our Anti-Scale Media system is using a matrix enable particulization, or MEP process which transforms these dissolved ions into non-charged, neutral chemical bonds, of calcium and magnesium crystals. These microscopic crystals of scale quickly form in treated water and cannot attach to pipes or any surface, and are rinsed away downstream in a colloidal suspension by the water flow. These crystals are heat resistant and are unable to revert to its dissolved state. The Anti-Scale Media System has a life of 5 to 7 years if the sediment pre-filter is changed every 3 months and the system has a KDF-55 filter and an Active Carbon filter as pre-treatment to protect the Anti-Scale media from Chlorination. This Anti-Scale Media System is not a water softener. It does not add chemicals or remove any minerals. It is a scale prevention device with proven third party laboratory test data and years of successful Food Service and Commercial applications. Anti-Scale Media is the intelligent scale solution as a great alternative to water softening (ion exchange) systems. 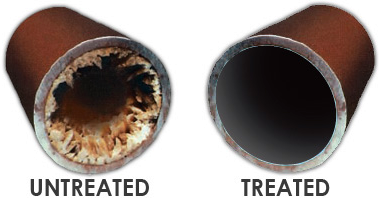 Our Anti-Scale media System also has a de-scaling effect on scale already present in old pipes, hardware, etc. The water coming from the media is free of calcuim ions. Calcium ions in the already existing scale are attracted to this unsaturated water and add on to the crystals that are now floating in the water. This way existing scale is usually heavily reduced or removed within one to two months. In addition to preventing scale, Anti-Scale media also prevents corrosion.